A delicious and creamy soup usually served for dessert. Try these recipe, it’s very easy and quick to prepare! Start by boiling the chicken bone and drumsticks in a pot until tender and cooked. Drain and rinse; set aside. Next, add in a pot the chicken, carrot, celery, garlic, bay leaf and water. Boil and lower the heat and simmer for 2 hours and season it with salt to taste. Then sieve the chicken stock and reserve the celery and carrots. Shred the chicken meat from the drumsticks and set aside. Finally, cook the macaroni in a salted boiling water and drain. 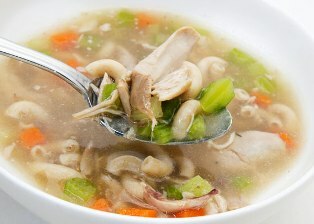 Then divide the shredded chicken, macaroni and vegetables on a serving bowls and pour the chicken stock and serve.